In the presence of Minister of Education, Science and Technological Development H.E. Mladen Šarčević, Ambassador of RS to London H.E. 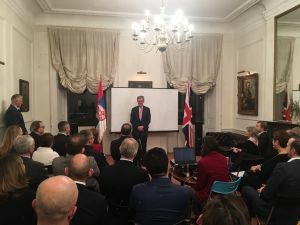 Aleksandra Joksimovic, RS Defence Attaché Slobodan Novaković, members of the diplomatic corps and diaspora guests, the documentary movie “The Forgotten Admiral Troubridge” by Snežana Zarić was screened at the Embassy of the Republic of Serbia in London. The film is dedicated to Ernest Troubridge, a British Admiral who crossed Albania during the First World War along with the Serbian army, took part in the breakthrough of the Thessaloniki Front and entered the liberated Belgrade. The screening of the film was also attended by the grandson of Admiral Troubridge, Sir Thomas Troubridge, his wife and son. Welcoming the audience, Ambassador of RS to London H.E. Aleksandra Joksimović emphasized that important historical moments are always permeated by personal fates that often remain in the shadow of great events. The significance of this film is precisely that it keeps from forgetting the memory of Admiral Troubridge and his role during the First World War. The life story of the British Admiral is also an unbreakable link inwrought in the brightest moments of our relations with the United Kingdom and is a good example of the good relations between the two countries we are working together for, pointed out Ambassador Joksimović. In his address, Minister Šarčević underlined the significance of marking the hundredth anniversary of the end of the First World War, reminding that Serbia paid a high price in that conflict by losing almost a third of the male population. The Minister emphasized the important role played by Admiral Troubridge as a member of the Serbian military command and reminded also of the immense contribution of the Scottish and English female doctors to the care of the wounded and sick, by establishing numerous field hospitals in Serbia during the First World War. 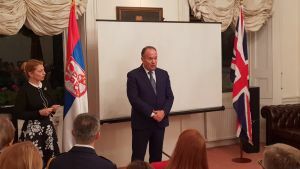 The grandson of Admiral Troubridge, Sir Thomas Troubridge, addressed those present, pointing out that during the shooting of the film in which he himself participated, he had the great honour to visit the places where his grandfather stayed in the war-torn Serbia. He expressed his gratitude to the Radio Television of Serbia, the RS Ministry of Defence and the Foreign Office, who, by supporting the shooting of the film, contributed to the fact that “the forgotten admiral is no longer forgotten”. 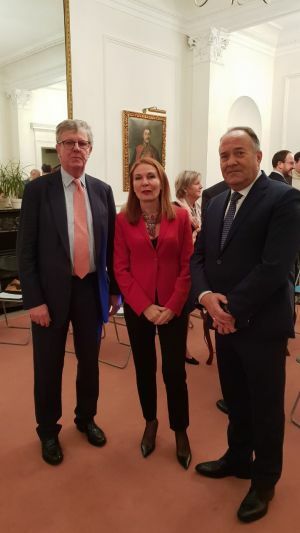 The event at the Embassy of the RS in London was organized in the context of marking the 100th anniversary of Armistice in the First World War, and also the beginning of the Month of Serbian Culture, which is being held for the eleventh year in a row in the UK.